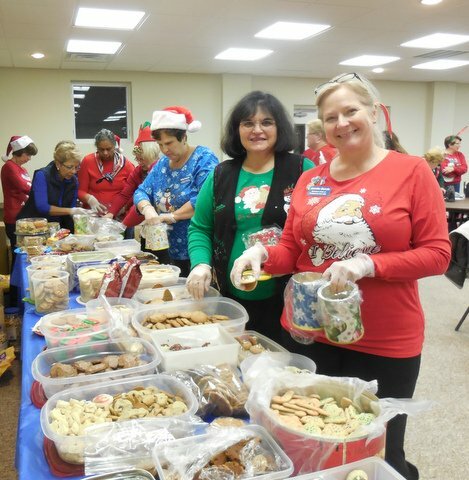 The Woman’s Club of Parsippany- Troy Hills (WCPTH) just held its annual Operation Candy/Cookie Meeting and wrapped over 210 tins of holiday cookies, along with 150 packets of holiday cards, for area nursing and care homes. The goodies will be donated to residents of The Country Home and The Morris View Health Care Center, both in Morris Plains, and Care One of Morris in Parsippany. Operation Cookie/Candy has been a project of New Jersey Women’s Clubs for over 50 years. Another recent holiday project of the club was Boatsie’s Boxes. Club members filled 52 Christmas stockings with toiletries, games, telephone cards and other items for members of the military serving overseas. These stockings were taken to the New Jersey State Federation of Women’s Clubs (NJSFWC) headquarters to be shipped with the 1200 stockings filled by the other clubs of NJSFWC. And later in December club members will be donating clothes, toys and other gifts to a family in the Adopt-A- Family Head Start Community Program of Morris County. Club members baked over 20 kinds of cookies. In front – Jennifer Biondo, Teri Wohld and Kathy Roussel. Spreading Holiday Cheer, the Woman’s Club is all set to package candy and cookies to give to area senior and care homes.